Shoulder pads, curtains and The Dominators (1968) | Randomwhoness: a Doctor Who blog by Johnny Spandrell. Sampling stories in random order. By far my favourite parts of The Dominators are the Dominators. They come in a mighty invasion force of two. And they wear mountainous shoulder pads which a. make them look like turtles and b. prevent them from looking at each other, unless they are standing face-to-face. This last point’s a real problem, because they spend most of these five episodes bitching at each other. The leader is Navigator Rago, played by Ronald Allen. Rago is like that irritating flatmate who’s permanently worried about the electricity bill, so goes around switching all the appliances off without asking. He’s always moaning about how much power the Dominators’ robot servants the Quarks require. When he discovers that their energy has been squandered (which happens over and over again), he lowers those dark eyebrows of his and hisses about power levels being dangerously low. I keep waiting for himself to argue that as he’s only been in the house 3 days in the last 7 he should only pay 3/7ths of the bill. Rago’s offsider is flagrant power waster Probationer Toba, played with seething resentment by Kenneth Ives. Toba’s solution to every problem is to destroy it, via Quark. Hence the constant depletion of their batteries which sparks Rago’s ire. Toba has a kind of barely suppressed blood lust which drives him to want to kill at the slightest provocation. My favourite moment is when he stands mid quarry and orders the Quarks to “Destroy! Destroy!”, but his restrictive costume means he can merely punctuate each “Destroy!” with a vigourous sway. Rago and Toba bicker like an old married couple throughout, but Toba always has to bow to his senior colleague’s will with a sullen “command accepted”. At one stage their simmering tension threatens to boil over into open conflict and as a race of belligerent warriors you might expect a few punches to be thrown. But those costumes don’t offer the freedom of movement to allow it. Still, I’d have enjoyed seeing Rago headbutt Toba bull-style in the gut, and leave Toba lying helplessly on his tortoise shell back, limbs flailing. And so to the Quarks. Writers Mervyn Haisman and Henry Lincoln, here writing under an outraged pseudonym, were reportedly trying to recreate the appeal of the Daleks when they dreamt up these odd little cubes with legs and spiky heads. Many had tried before them; Chumbleys, War Machines even Terry Nation’s own Mechanoids were all attempts to replicate that mysterious appeal. And although the Quarks have a sort of geometric charm, they are no Daleks. For a start, you can understand what a Dalek says. Quarks have squeaky little voices which are, in the main, unintelligible. The DVD’s subtitles are essential. And although a Quark has two more legs than a Dalek, this doesn’t seem to make it any more mobile. At one stage, companion Jamie (Frazer Hines) immobilises one by tipping it over and gently leaning on it. Any alien you can stop by sitting on is not destined for greatness. The hapless targets of the Dominators’ aggression and the Quarks’ warbling are the gentle Dulcians. Pacifists one and all, they have abandoned fighting and concentrated on loftier pursuits. Sadly dressmaking is not one of them. They dress in unflatteringly revealing numbers which look distinctly like curtains. This is fine if you’re as pretty as Felicity Gibson who plays Kando and manages to transcend her own drapey number. But the other Dulcians must be eyeing off those power dressing Dominator outfits with envy. Among those Dulcians is Cully, a hot headed young firebrand, who’s all about doing his own thing and sticking it to the old man back in Dulcian HQ. Unfortunately in a piece of woeful miscasting, this young hero is played by Arthur Cox, who looks like a mild mannered insurance salesman. In a dress. There’s nothing wrong with Cox’s acting, it’s just he’s cast mystifying against type. Cully spends a lot of time blowing up Quarks with new bestie Jamie; if anything he should be out highlandering the highlander. But he’s less wild thing than mild thing. The other Dulcians, be they gormless students on excursion or procrastinating bureaucrats are difficult to sympathise with. And with the bombastic Dominators on the other side of this conflict, there’s no-one to side with really. Haisman and Lincoln designed this story as a critique of pacifism, and if that sounds politically dodgy to you you should read Philip Sandifer’s demolition of this story here. Me, I find it difficult to take this story too seriously. If there is a politically iffy message behind it, no-one seems to be honouring it with much effort. It’s left to the fag end of the season, its performances and design work are half hearted and it famously bored its producer and script editor into lopping off an episode. (Certainly the right decision; Episode 5 takes a brisk pace missing in the story’s earlier installments). But if you’re looking for a saving grace, here’s Patrick Troughton (in the studio anyway), refusing to let a dodgy script dampen his inventiveness and charm and basically holding the whole thing together. Haisman and Lincoln were apparently less than pleased with the serial’s abbreviation. Then they got into a stoush with the BBC about who owned the merchandising rights to the Quarks (the Quarks, Lord help us. If Quarkmania was a thing, I missed it). Apparently they even threatened to stop The Dominators from being broadcast. I can picture them now in some dingy BBC office, sniping across a desk at the suits from legal. Glaring and bickering. I like to think of them wearing jackets with big shoulder pads. The Rago and Toba of their day. 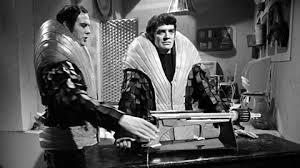 LINK to The Tenth Planet: mechanical baddies. Three in a row! NEXT TIME… How shall we know if gods walk among us? It’s the beauty and horror of The Aztecs. “Apparently they even threatened to stop The Dominators from being broadcast.” They could’ve done everyone a favour. But can you imagine the undeserved mythos that would then have built up around The Dominators? The Shada of its day! Fair point. One version of the story is more than enough!